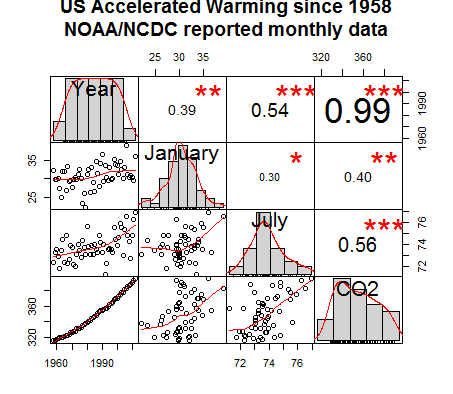 In a previous post I highlighted some representations of the temperature and CO2 data. I created my chart using Excel. It confirmed the conclusion that CO2 is barely correlated with temperature. It takes a climate scientist to look at these correlations make the argument that CO2 is the cause of the temperature increase. I decided to take another look at the data using my the statistical software, R, and the PerformanceAnalytics package. Using a R program Stephen Turner published on his blog, Getting Genetics Done. Here is the chart I came up with. We can see that the best correlation is between CO2 and time. The correlations between July temperature and time and between July temperature and CO2 have similar values. Which is the driver of July temperature, time or CO2? If CO2 is the driver why do we not see a similar correlation for January temperatures? For some this is settled science. Here is my original Excel chart again.